Ever since MFS was founded, volunteers have been an indispensable part of our organization. Our dedicated volunteers make an impact on a daily basis, from cleaning barns and cutting up fruits and veggies for the animals to helping organize events and raise money behind the scenes. Read more about our volunteer opportunities below. MFS needs volunteers seven days a week for barn cleaning duties. We are currently seeking volunteers who can make a commitment to be at the sanctuary on the same day every week from 12-4pm. We have volunteer shifts open all days, including weekends. All barn volunteers must be 18 or older. Please note that for safety and liability issues, volunteers are not permitted to bring young children with them while they are volunteering. If you are interested in becoming a barn volunteer, please fill out our volunteer application and someone will get back to you shortly. If you have additional questions, email volunteer@maplefarmsanctuary.org. Picking up produce from area grocery stores and bringing it to MFS. Volunteers can sign up for weekly, monthly, or other regular pick-ups and need a car that will fit several large boxes. Most pick-ups must be done in the morning or early afternoon. Helping chop fruit for the animals at the sanctuary. We need volunteers who can spend approximately 1-2 hours cutting fruit on a regular basis in the afternoon. Contact volunteer@maplefarmsanctuary.org or fill out our volunteer application if you are interested in helping with either of these volunteer activities. 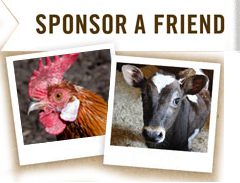 Please email your interest and tell us a little about yourself and your experience to jenw@maplefarmsanctuary.org. Please fill out our volunteer application or contact volunteer@maplefarmsanctuary.org for more information about these projects!